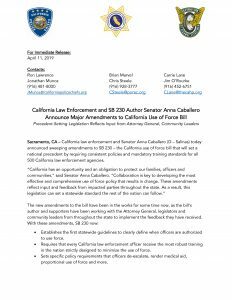 California law enforcement and Senator Anna Caballero (D – Salinas) announced sweeping amendments to SB 230 – the California use of force bill that will set a national precedent by requiring consistent policies and mandatory training standards for all 500 California law enforcement agencies. Establish the first statewide guidelines to clearly define when officers are authorized to use force. Require that every California law enforcement officer receive the most robust training in the nation strictly designed to minimize the use of force. Set specific policy requirements that officers de-escalate, render medical aid, proportional use of force and more. Set forth detailed, standardized requirements for reporting all instances when force is used in our communities. Specify that use of force policies and training are considered in legal proceedings.